Why Do I Have a Sore Jaw? A sore jaw can make your everyday life uncomfortable. It might be difficult for you to enjoy your favorite foods, and carrying on a conversation could become cumbersome. It’s amazing how such a small part of the body can make you so miserable. Fortunately, relief isn’t far away. An achy jaw is often a symptom of TMJ disorder. How can you recognize this condition, and what should you do to treat it? The TMJ is the joint that connects your lower jaw to the rest of your skull. 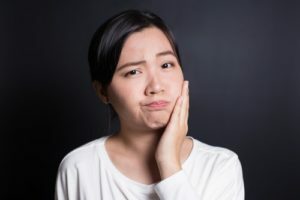 When something goes wrong with this part of the body, many people saw they “have TMJ.” However, everyone has a TMJ — two TMJs, actually. There’s only a problem when a person has TMJ disorder. There are several possible causes for TMJ disorder. It might come about if you’ve been under a lot of stress lately, or it could happen as a result of a jaw injury. Bruxism (teeth grinding) is also a common cause. In some cases, the condition occurs for seemingly no reason at all. Women are more likely than men to suffer from TMJ disorder, but it can afflict people of both sexes. If you’re tired of having a sore jaw, there are things you can do to ease your pain and get back to having a face that feels good. Facial exercises and massage may help, and you can use mild painkillers to address your discomfort. Also, try to take a step back from the rigors of everyday life and set aside some time to do things you love. A bit of destressing time might be all your body needs to heal itself. You should also pay a visit to your local dentist. They can design a custom oral appliance for you to wear at night. It will prevent teeth grinding, which is often connected to TMJ disorder. It can give your jaw a chance to rest along with the rest of your body while you’re off in dreamland. Why is visiting your dentist so important when you could get a generic treatment for bruxism from your local pharmacy? The items you buy over the counter aren’t made for your specific needs; they’re much less likely to be effective than something a professional designs especially for you. Do you have an achy jaw because of TMJ disorder? A bit of time with your dentist could be the key to healing. Dr. Dale Greer is your friendly, compassionate dentist in Dallas. He wants to help his patients live healthy, pain-free lives, which is why he happily provides oral appliances that battle bruxism and TMJ disorder. If you have a sore jaw or any other concerns about oral health, contact our office at 972-233-4546. Comments Off on Why Do I Have a Sore Jaw?